Veneto is one of the 20 Italian regions, situated in the north-eastern part and the capital of the region is Venice. Veneto was a part of Venetian Republic which was the longest lasting republic in human history and it lasted for 1100 years. It is a beautiful region famous for its all year round tourist season. Due to its varied landscapes, in Veneto there are many amazing places to see, from the peaks of Dolomites, breathtaking Venice, Lago di Garda lake, Padova which is one of the oldest cities in Italy to the city of love, Verona. Venice, the capital of Veneto region, was onc e one of the richest cities in the world and the splendor of riches past is still very visible all around the city. It is located on a group of 118 islands in the Venetian lagoon in the north-western corner of the Adriatic Sea. The city’s wealth came from its role as an important center of trade and maritime power. Today the economy is heavily based on tourism in the historic center and industry in the mainland part of Venice still making it one of the richest cities in Italy and Europe. The main sights include the Grand Canal, Piazza San Marco square, San Marco cathedral and bell tower, Ponte Rialto bridge, Ponte dei Sospiri bridge, Madonna della Salute church and the Dodge’s Palace. The city and it’s lagoon are listed as World Heritage Sights and Venice is famous not only for its architecture but also for it’s extremely rich collection of artwork accumulated during the city’s long history. Venice was the birthplace of many important historic individuals like Marco Polo and Antonio Vivaldi. 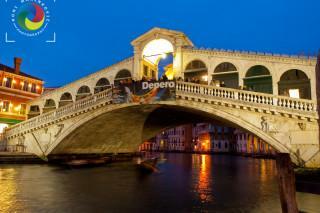 The main events are the famous Venice Carnival, Venetian Biennale and the Venice Film Festival. 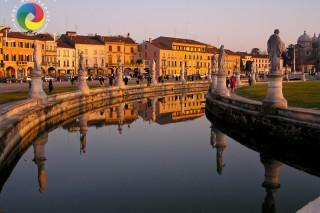 Padua is believed to be the oldest city in Northern Italy, dating back to the 10th or the 11th century B.C. The city center was surrounded by 11 km of city walls and some parts are still visible today together with two gates and a castle which was transformed into an astronomical observatory back in 18th century. It is best known for it’s university founded in 1222 renowned especially for medical studies and having had Galileo Galilei among its lecturers. Padova also hosts the oldest botanical garden in the world, founded in 1545. There are numerous amazing sights to visit in Padua. The Scrovegni chapel is famous for Giotto’s frescoes. Palazzo della Ragione is a medieval town hall, built in the 12th century and famous for having the largest roof unsupported by columns in Europe (81 m length). Basilica of Saint Anthony of Padua is one of the biggest buildings in the city, dominating its panorama and it is also one of the most visited places holding the remains of the Saint. Prato della Valle is an elliptical square and one of the biggest in Europe with its 90,000 m². Besides the Basilica it is one of Padua’s symbols. Other important sights are the Abby of Santa Giustina, the Astronomical Observatory, Palazzo del Bo and Pedrocchi Caffe. Lago di Garda is situated in northern Italy, at the footsteps of the Alps, halfway between Venice and Milan. It is the largest lake in Italy having the surface of around 370 km². The shores of the lake are divided between three Italian regions: Veneto, Lombardia and Trentino-Alto Adige. The lake is very popular tourist region and it is visited by millions of tourists each year. The northern part of the lake is long and narrow standing between the mountains and the southern part is large and wide reaching the Po Valley. The lake holds five rather small islands. Ever since the Roman times geothermal springs around the lake were used for medical purposes. Sirmione was an especially privileged place for the presence of the sulfur springs that allowed spa use. Sirmione sits on the peninsula on the southern shore of the lake, where was built an impressive castle with a military port and defensive wall with towers around the village. Peschiera del Garda is one of the biggest towns on the lake, also surrounded by medieval city walls and today famous for its nearby modern attractions like Gardaland, Movieland, Safari etc. There are many other towns along the shores of Garda lake, each of them having its own castle and medieval city walls and some of them being very famous for their local variety of wine and olive oil. The city of Verona, well known as the site of Shakespeare’s masterpiece Romeo and Juliette, has been declared a World Heritage Site by the UNESCO for its architecture and urban structure. The city is one of the best examples of an urban place that developed during 2000 years of uninterrupted history with each of the eras having left great examples of art and architecture of supreme level. 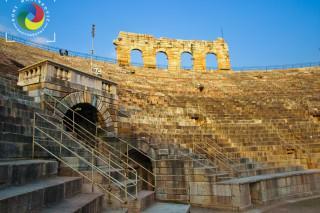 Verona can boast about having five city walls built at different times but still visible. The city lays on the river Adige and the area was first settled by ancient Romans. The most important monument from that time is the Roman Arena, which is the third largest amphitheater in Italy, after the ones in Rome and Capua, but what makes it different is the fact that it is not a ruin but it is also being used for concerts and shows. The most important monument from medieval times is Basilica of San Zeno, considered one of the masterpieces of Romanesque architecture in Italy. Verona has numerous buildings and sights worth visiting from many different centuries, spectacular bridges and impressive towers and castles. A must see is also Juliette’s house with the famous balcony and her statue in the courtyard. The Dolomites are a mountain range in eastern Italian Alps with the highest peak called Punta Penia, that belongs to Marmolada mountains and stands at 3344 meters. They were also known as the “pale mountains” for their characteristic light gray, almost white color. In 2009, Dolomites were listed as a World Heritage Site by the UNESCO. There are 18 peaks that are higher then 3000 meters and this terrain configuration is ideal for skiing during the winter, rock climbing, hiking, cycling during spring and summer. Dolomites Marathon is an annual single-day road bicycle race which includes seven impressive mountain passes, National Geographic described it as “one of the biggest, most passionate, and most chaotic bike races on Earth”. 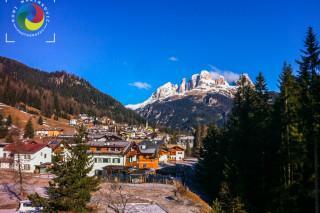 The Dolomites have various ski resorts, among most popular are Cortina D’Ampezzo and Madonna di Campiglio. It offers some of the most breathtaking views and mountain landscapes known to man, with vertical walls, sharp cliffs and many narrow, long and deep valleys. There is one national park and numerous regional parks located in the Dolomites. Other interesting places to see are Strada delle 52 Galleria which is a military mule road with 52 tunnels built during the WWI and Cala del Sasso, a path that consists in 4444 steps and it is the longest staircase open to the public in the world.